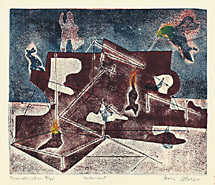 Margo's innovations as a painter/printmaker, include the development of "decalcomania," (a favorite technique of the Surrealists) and the invention of the cellocut, a forerunner of the collograph and other high-relief printmaking processes. In this method, liquid plastic that has been dissolved in acetone is poured onto a rigid support backing, such as fibreboard or cardboard. The solidified plastic can be textured, raised into relief, and worked with various tools. It can be engraved, scratched, sanded, and filed. 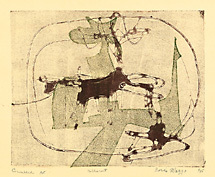 The resulting plastic plate can be printed either as a relief or as an intaglio plate, or both.The cellocut can be printed alone or in combination with other techniques: thin layers of plastics can be placed on top of intaglio plates and printed together. 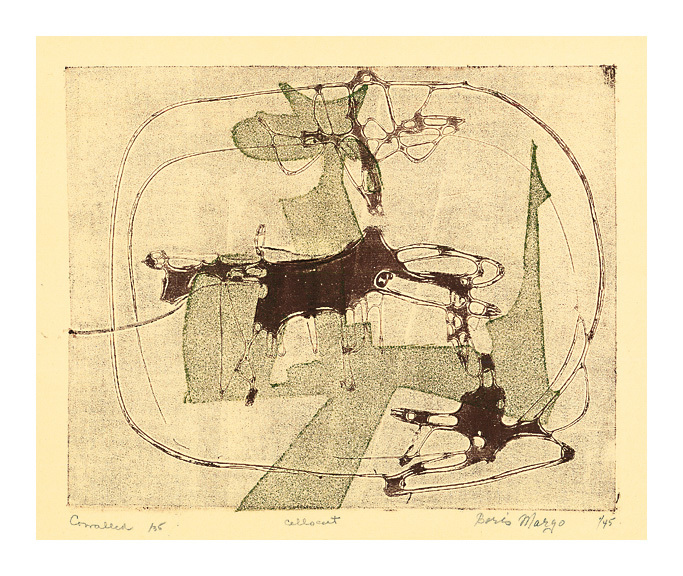 The Betty Parsons Gallery represented Margo from 1947 to 1962 and since that time, his work has been exhibited extensively throughout the United States and Europe. 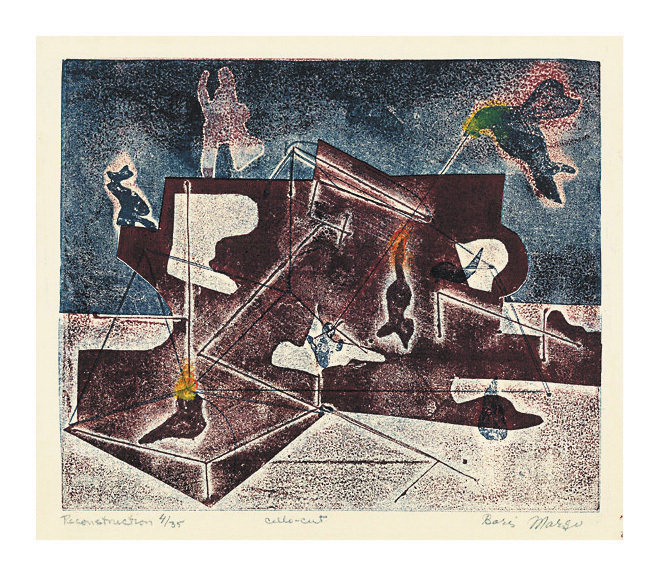 Margo is represented in numerous public collections including the Art Institute of Chicago, The Metropolitan Museum of Art, The Museum of Modern Art, National Museum of American Art, and Whitney Museum of American Art. Reconstruction = 1942, Color Cellocut. Edition 35. Signed, titled, numbered 4/35 and annotated cello-cut in pencil. Image size 8 3/4 x 10 5/8 inches (222 x 270 mm); sheet size 11 1/4 x 11 3/4 inches (286 x 298 mm). A fine impression, with fresh colors, on cream wove paper; full margins (1/2 to 1 1/4 inches), in excellent condition. Corralled = 1945, Color Cellocut. Edition 35. Signed, dated, titled, numbered /35 and annotated cellocut in pencil. Image size 8 7/8 x 11 1/8 inches (225 x 283 mm); sheet size 11 7/8 x 13 3/8 (301 x 340 mm). A fine impression, with fresh colors, on cream wove paper; full margins (1 1/4 to 1 3/4 inches), in excellent condition. Ex-colllection William S. Liberman, Curator of Drawings and Prints, MoMA.